Romesco is my new favorite addiction! (What You Should Know About Your Teen’s Addiction) Not to be confused with Romanesco, a seriously gorgeous chartreuse vegetable which looks like is a cross between broccoli and cauliflower, Romesco is a delicious Spanish dip/sauce which combines roasted red peppers and almonds and other flavorful ingredients. I love it so much that I eat it straight out of the bowl, but it’s also amazing on roasted or grilled vegetables, with grilled or roasted protein, or with crudites. 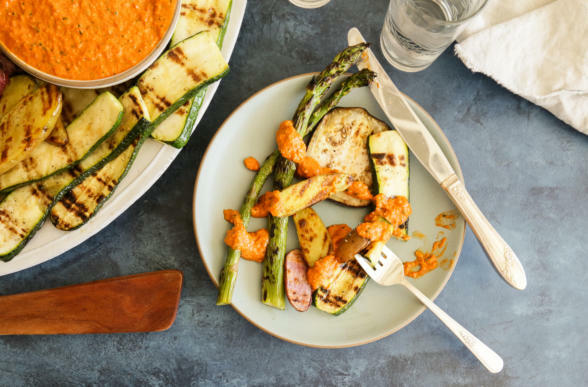 This Romesco recipe comes from my friend Amanda Frederickson, a super talented food blogger and recipe developer. Trust me, I tried to create a Romesco sauce that was different from hers, but none turned out any better. Amanda’s recipe is exactly the way I like it – tangy, a little smoky, textured, and the perfect consistency, not too thick and not too loose. And I haven’t even mentioned how ridiculously easy Romesco sauce is to make. Soooo easy! I need more recipes like Romesco in my life. It goes with everything. It’s totally healthful and nutritious. You can make it in seconds. And you can make it all year long using jarred roasted red peppers. It is also the ideal recipe for entertaining or feeding a crowd since it can be multiplied very easily and it can be made in advance. My advice is to make more than you need because everyone will love it and you’ll be dreaming about leftovers! In the bowl of a food processor (use a blender if you don't have a food processor), add the peppers, garlic, almonds, tomato paste, parsley, red wine vinegar, paprika, and large pinch of salt. Drizzle in oil and process until desired consistency is achieved. Serve immediately or in the refrigerator for up to two weeks. To grill vegetables, brush vegetables lightly with olive oil and sprinkle with salt and pepper. Cook on a grill that has been pre-heated to medium-high heat. Turn after achieving char marks on the underside. This can take 3 minutes or 5 minutes, depending on the type of vegetable you use. If you want to grill baby potatoes, boil them first in salted water for 5 minutes. I like to cut eggplant between ½ and ¼ inch. I like to cut summer squash into ½-inch slices so they don't get mushy. 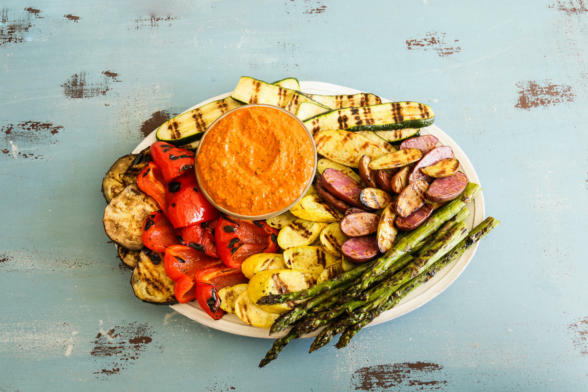 Grilled and roasted vegetables can be served hot, warm or at room temperature. They can also be cooked a day in advance and reheated in a 350-degree oven or brought to room temp. 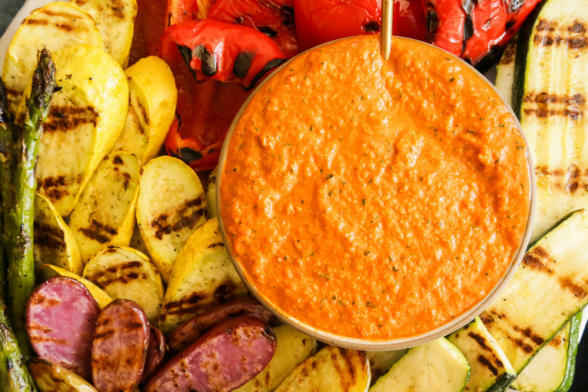 Serve Romesco on the side. *Feel free use homemade roasted peppers in this recipe! You'll need about 3-4 peeled and seeded roasted peppers, depending on the size. See the Basics section of my cookbook for how to roast red peppers.